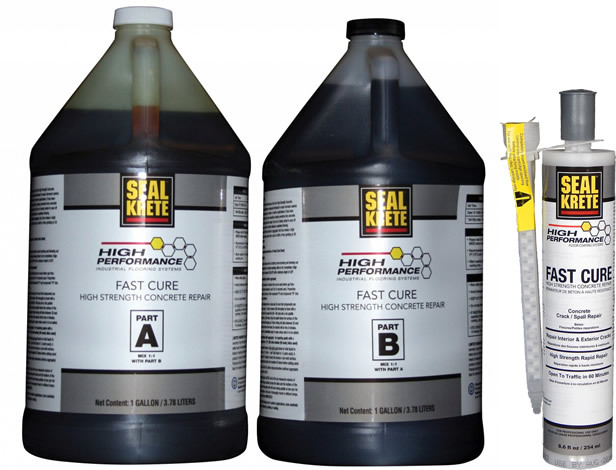 Seal-Krete High Performance Fast Cure High Strength Concrete Repair is a polyurethane compound developed to repair dormant control joints, spalls and pop on interior or exterior applications. It has been formulated with a very low viscosity to deeply penetrate into concrete cracks providing structural repair. Fast Cure is ideally suited to seal off cracks and saw-cuts to further enhance a seamless flooring environment. With the addition of aggregate, Fast Cure makes a high quality spall repair product that is open to traffic or floor grinding in less than 1 hour.